Could Drug Testing at Work Solve the Country’s Opioid Epidemic? As the opioid epidemic continues unabated in the U.S., more advanced mechanisms to test for opioid-laden drugs (and medications) have become a popular new edition to pre-employment background checks. The justification, of course, is safety (with a healthy helping of CYA mixed in): “[It’s] a prudent way to limit risks and liabilities,” according to Laura Shelton, the executive director of the Drug & Alcohol Testing Industry Association. Employers are encouraged to drug test their employees (both new and old) for other reasons, too — e.g., to maintain a productive workforce (a belief that assumes drug use always curtails one’s performance); to fight absenteeism; and to lower both medical costs and high rates of employee turnover. Nor is it just opiates employers are concerned about. In a recent MEL story about the long-term effects of adderall usage, Timothy Fong, a clinical professor of psychiatry at UCLA, said employers should at least consider drug testing employees in order to minimize the illegal use of “performance enhancing drugs” in the workplace — namely, adderall, which can be addictive and even neurotoxic when snorted or mainlined by users looking for a stronger high. This obviously begs a couple of giant questions/issues. First and foremost: Isn’t this a massive civil-liberties violation — or at the very least, a serious encroachment on them? And second: Do employers have any business getting involved with so-called matters public health in the first place? What’s especially confusing is how employers expect to accurately test employees in the first place given how varied our medical and recreational uses of the same substances are. Case in point: A lot of people are legally prescribed (for chronic pain, for ADD, etc.) the exact pharmaceuticals that others want to “crack down” upon in the workplace. So for accurate drug testing, an employer would need to collect even more personal information about someone’s health, information we typically have the right to keep private. And what about medical marijuana? Now that most states have medical-use policies, how is it fair for applicants to be denied employment or existing employees randomly terminated because they smoked (or ingested) weed? There’s also the question of sector-specific permissibility — like tech guys who swear by nootropics or microdosing on psychedelics to improve their creativity, stamina and access to “insights.” Is it unfair that in the private sector, some people wouldn’t be able to get hired because of drugs while others are lauded for their experimentation? On that note, would a drug test have detected the fact that the ketamine I took last year was for psychotherapy and not from a recent rave? Michael R. Frone, the senior scientist at the Research Institute on Addictions at the University of New York at Buffalo and the author of Alcohol and Illicit Drug Use in the Workforce and Workplace. Lewis Maltby, the president of the National Workrights Institute, an organization dedicated to human rights in the workplace, and the author of Can They Do That? Retaking Our Fundamental Rights in the Workplace. Frone: With the exception of heroin and methamphetamine, which are used by a small proportion (0.5 percent or less) of the workforce, only a relatively small proportion of people who use a drug illicitly have a substance-related disorder. In other words, most users aren’t dependent or addicted. Nor is there credible data that shows that drug testing reduces illicit drug use in the workforce, especially if we focus on the non-safety sensitive workforce, not people who are working in transportation or other industries where safety is a huge concern. The drug-testing industry promotes this argument to employers without reasonable empirical support and employers appear to accept it. Not to mention, an employee’s positive drug test doesn’t say anything about when or where the substance was used; how much was used; whether the person was impaired at the time of testing; or if they were ever impaired at work. Also, most substance use occurs off the job. Therefore, it’s unlikely to affect performance. As to the question of Adderall, so-called “performance-enhancing drugs” aren’t likely to have an appreciable impact on performance, even though people using them might perceive that to be true. This hasn’t been tested among employees, but there has been some longitudinal research on nonmedical use of prescription stimulants for performance enhancement in school among college students that showed zero evidence of enhanced performance. Currently, I’m writing an article about the use rates of the 13 separate psychoactive substances in the workforce, and I’m looking at the numbers for illicit prescription drug use overall, not just Adderall, because the results would be too small and crude if I did that. I’m looking at overall use rates from 2016 and work-related rates from I study I did between 2002 and 2003. 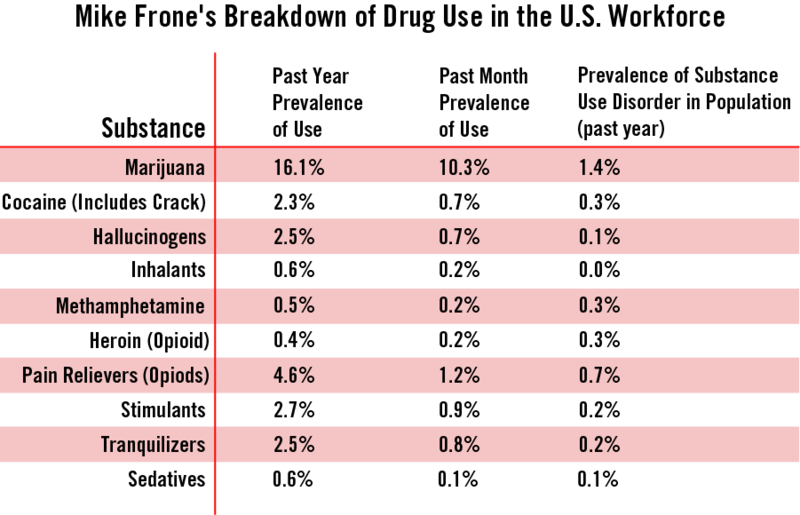 Excluding the three legal drugs (caffeine, nicotine and alcohol), marijuana is the only other substance with an appreciable rate of use for the past year or past month. Plus, by comparing the prevalence of past year use to the prevalence of past month use, you can see not everyone will be a frequent or regular user. Do these rates of use justify the general use of employment-related drug testing? I’ll let you decide for yourself. Maltby: I don’t believe drug testing for opioids or performance-enhancing drugs would be of any public health service to the country. Nor do I think drug testing for unprescribed Adderall use in workplaces would make things more fair. After all, employees aren’t performing any better, necessarily, because of their Adderall use. So drug testing at work is a political program, not a safety program. Recently, I spoke to the CEO of a Fortune 500 company and asked them why they still bother drug testing employees when it’s such an expensive, pointless process. I didn’t get a good answer. I think in terms of pre-employment drug testing today, companies just don’t want the press they may receive if they abolish it. They don’t want the Reefer Madness crowd on their case about them doing away with drug testing. The sort-of unspoken truth is if you can’t pass a pre-employment drug test in order to get a job, you’re probably too stupid to work there anyway. People apply for a job, stop smoking weed or whatever, get the job, pass their drug test and then go right back to doing what they like to do — in this case, smoking weed. And random drug testing tells you zero about someone’s current condition. Most of the time it only tells you who smoked a joint instead of having a beer on Saturday night, or who smoked a joint with their beer. Drug tests can’t tell you who is super high in that very moment, because the substances haven’t metabolized yet. Drug tests are also biased. For example, a big issue in workplace drug testing right now is the hair test. Some employers collect hair follicles instead of urine. This is problematic because substances can last in the hair much longer than in your blood or urine. In general, hair tests are imprecise. Someone could’ve snorted cocaine off the dollar bill you got from the ATM, and it shows up on you. In this way, drug testing is racially biased as well. African Americans typically have hair with a coarser texture, meaning substances can last longer than they do in a white person’s hair. The numbers bear this out: We see African Americans in the workplace failing hair tests and getting fired for it more frequently than we see it happening to other races. Basically, this is all left over from the Reagan era. As president, Reagan mandated drug tests for all federal employees and many companies followed suit. So it’s as much of a relic as the “This is Your Brain on Drugs” commercials.